Give yourself a generous slice of a morning or afternoon to enjoy making bao-bread without being rushed. This is a relaxed spacious recipe with plenty of room to do other enjoyable things while the dough rises. Read a book, spend some time in the garden or slowly prepare the rest of your meal. You’ll be calm and ready to welcome the faces attracted by the irresistible aromas soon to be wafting from the oven! This is a cheesy bread that’s big on flavour, the baobab powder lending a light sour-dough taste. The harissa gives a burst of spice and some heat, while the rosemary tops it off with a herby tang. This makes it a great bread to eat on its own just with butter. With the harissa giving it a North African twist, it also makes for an excellent dunking bread for lamb tagines or chicken curries. Or very simply dipped in olive oil and a flavourful Egyptian Dukkah. 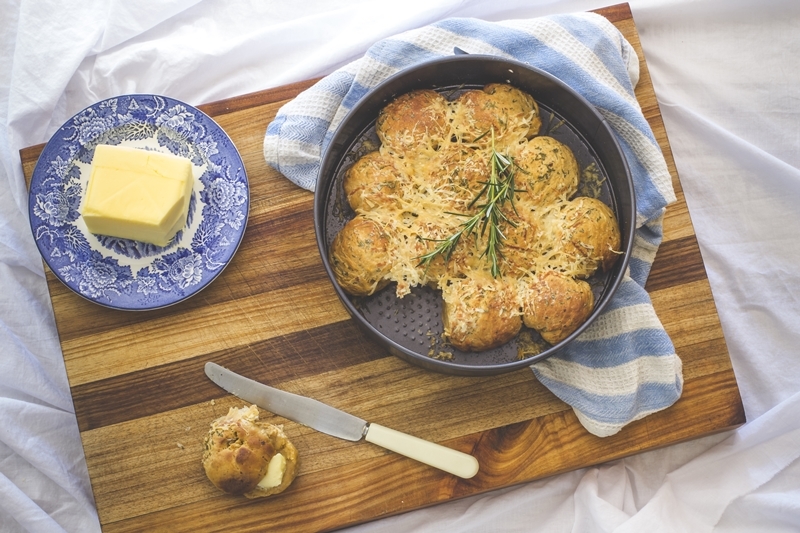 Especially developed for EcoProducts by Candice Douglas of the Social Post, this bao-bread is a tried and tested recipe that focuses on exceptional taste using locally produced natural ingredients. 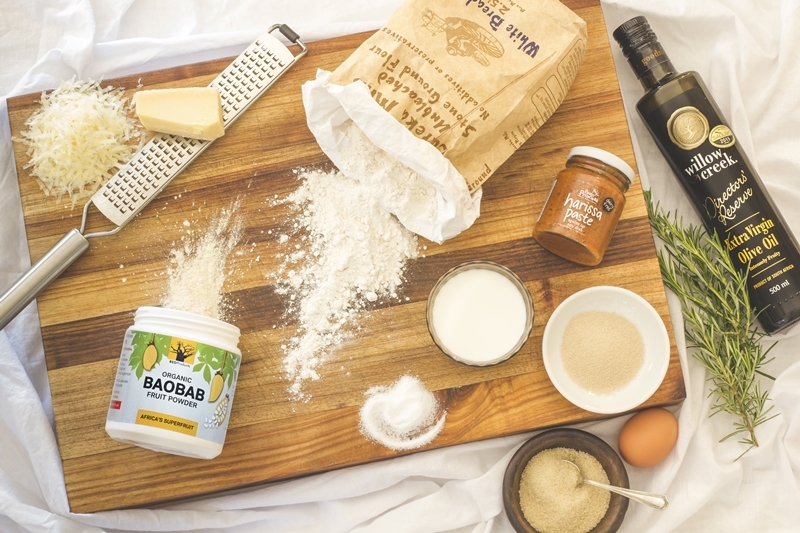 We’re talking Oryx Desert Salt, Eureka Mills flour, Pesto Princess Harissa , Willow Creek Olive oil and of course baobab powder . Stir rosemary into 2 tablespoons of olive oil and set aside. Preheat the oven to 150ᵒC for 10 minutes, and then switch off, keeping the door closed. In a large mixing bowl, or the bowl of a stand mixer, combine flour, baobab powder, and dry instant yeast. In a separate bowl, whisk together until combined: warm milk, harissa, sugar, salt, egg, and 1 tablespoon of olive oil. Add to the flour: warm water, milk mixture, and ½ of the pecorino. If you are using a stand mixer: use your dough hook on a low speed to knead the dough for about 10 minutes, until the dough is soft and smooth and is pulling away from the sides of the bowl. If your dough stays wet and sticky, add more flour one tablespoon at a time until your dough is soft and smooth. Roll into a large ball, place back in the mixing bowl, and cover with a clean damp tea towel. Place bowl in the pre-warmed (and switched off) oven and shut the door. Leave to rise for an hour. If you are kneading by hand: knead the dough on a clean floured surface for 10 to 15 minutes until the dough is soft and smooth. If your dough stays wet and sticky, add more flour one tablespoon at a time and knead in, until your dough is soft, supple, and unsticky. Roll into a large ball, place back in the mixing bowl, and cover with a clean damp tea towel. Place in the pre-warmed oven and shut the door. Leave to rise for an hour. Once your dough has risen (it should have almost doubled) remove it from the oven and pre-warm the oven again at 150ᵒC for 5-10 minutes. Punch the dough down firmly with your fist a few times. Roll the dough out with your hands until it forms a thick sausage. Cut into 12 equally sized pieces and roll each piece into a ball. 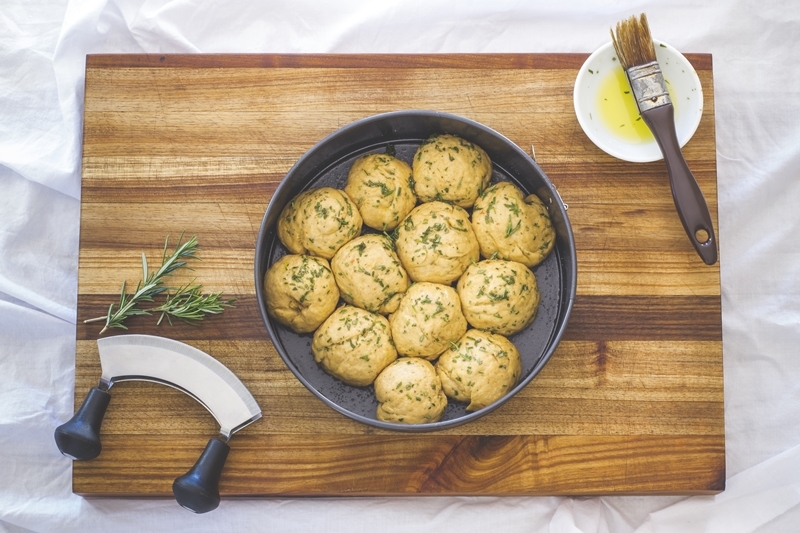 Arrange the dough balls in the middle of a round cake tin so that they’re gently touching, and cover with a clean damp tea towel. Making sure the oven is switched off, put the rolls into the warm oven for 30 minutes to allow the rolls to rise. Brush the tops of the rolls with rosemary infused olive oil and sprinkle salt over them, about 2 to 4 tsp, depending on your taste. Top with the remaining ½ cup Pecorino cheese. Place the rolls in the center of the oven, shut the door and immediately turn the heat down to 180ᵒ Bake for 30 to 45 minutes, or until the tops are nicely brown and the rolls sound hollow when you gently knock on them. Serve hot with fresh farm butter, or with olive oil and dukkhah. Chef’s Tip: these freeze well, so if you have any left over, pop them into a freezer bag. They defrost quickly on a rack over the toaster.